David Tennant attended the Lords Of Time Fan Convention at the Hilton Metropole Hotel in Birmingham on Sunday 9th September. The convention started on Friday 7th but David was filming two episodes of Comedy World Cup just outside London on the Saturday. The convention was at the Hilton Metropole Hotel in Birmingham where the convention in December will also be held. Tickets are available from this link. Tickets are �5 for Gold, �5 for Silver and � for Standard. 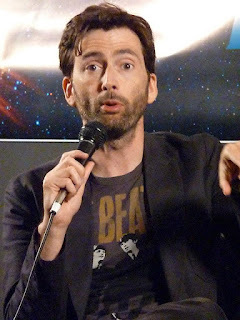 The prices for additional items from David Tennant are that autographs will be � each and photos with David will cost �. Everybody at the convention will receive one free autograph from each of the guests including David. The convention was held by ShowMasters. They have a forum where you can ask questions about the event. David Tennant will also attend the Midnight Fan Convention in Birmingham on 16th December. For posts related to David Tennant at the Lords Of Time Fan Convention on Blogger.com click here. David Tennant will attend the Lords Of Time Fan Convention at the Hilton Metropole Hotel in Birmingham during the weekend of 7th to 9th September 2012. The exact date David will be there has not been announced yet and the ShowMasters website promptly crashed as soon as David was announced! The convention is at the Hilton Metropole Hotel in Birmingham where the convention in December will also be held. The convention is being held by ShowMasters.